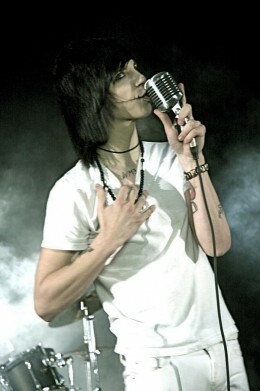 Andy Six was born Andrew Dennis Biersack, he was born in Milwaukee- Wisconsin but moved to Cincinnati- Ohio at a young age. This outstanding young man was brought into the world on December 26th, 1990, making him 20 years of age. When Andy was young, he was the "out-cast" as you could say among many. Andy 6, was a character created to hide himself from the dangers of the world, then later on Andy Six, became who he is today. He prefers Andy 6, or Andy Six over Andy Sixx anyday. Many people make the mistake of spelling it with double X's. As a kid, he was over weight (in which he decided to lose the weight at the age of 13), and one of the only kids that adored to sport black. Of course alot of people that he was off, and weird. They avoided and mocked him, calling him names, such as "fag" and "emo". Andy started out his musical carrer at the age of 14. Naming his band "Biersack", with a few of his friends participating in it. The mainly played the old cover songs of "Alkaline Trio" and "the Misfits". As he realized people really seemed to be enjoying what "Biersack" brought to the table, Andy knew he had to do something more. Thus, Black Veil Brides was finally born. During his school years, Andy became used to jumping from place to place for reasons of his own, as well as his family's such as, the bullying and torment. The boiling point was reached to him and his parents after his family came to know the life of vandalization. Andy's possesions would be destroyed, his friends, realitives, and own family were threatened. Andy does infact have tattoos. On his right arm, a 13" Azreal Batman, Andy's favourite comic book character as a child, on his left arm he has an Alkaline Trio heart with his Ex-girlfriends initials on the teeth (Scout Taylor-Compton) , a bleeding misfits skull along with a danzig skull and a funeral presession flower.